Today is the final day of March, so it is also the last day of daily slicing, a challenge hosted by Stacey and Ruth at twowritingteachers.wordpress.com. 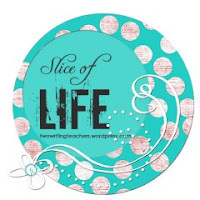 I am so glad that I participated in the Slice of Life Challenge throughout the month of March for many personal and professional reflections. This morning, before I go hide 300 Easter eggs and make lunch for seventeen, I will try to list some of them. I wrote creatively. I have spent so much time over the last year with a new blog writing about the practice of teaching that I left my private writing life and I didn't realize how much I miss it until I re-visited it this month. To honor the mission of the professional blog that I share with Melanie Swider (tworeflectiveteachers.blogspot.com), I started a new blog for my stories and more personally-oriented work. I will continue to write as much as I can at justwritemelanie.blogspot.com. Audience matters. The connections to a world of writers propelled me. Even though I belong to a writers' group, we meet monthly at best and the instantaneous response in the world of the Slice Challenge felt great. This reflection has an impact on my ideas about teaching practices. I didn't always want to know what I can do better in a piece; I wanted to know that someone had read it and thought enough of it to say something. Writing begets writing. I have heard people compare writing and reading to exercise in that the more we do them, the easier they become. 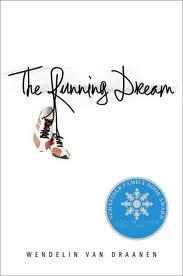 I never had that experience with running--it always stays hard!-- but I did have that experience with writing. Daily writing became part of my day. Reading other people's writing inspires writing. I found inspiration in other people's posts all the time--what they did during the day that became important through documentation, memories that they shared, important people. I wonder about this last two realizations and our practices as writing teachers. 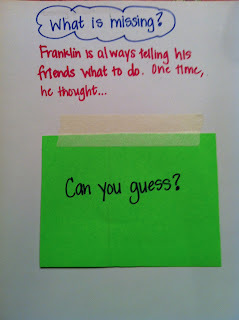 Do we have time in the workshop set up for reading and responding to each other's work? Is the typical five minutes enough? There were definitely days when I spent more time reading and commenting than on writing. Alan Wright's blog is called Living Life Twice because, he writes on his blog, "People who write get to live life twice - in the moment and in retrospect. That's what sets writers apart. I rarely go anywhere, or do anything without the shadow of my writing self being part of the adventure. Every experience provides opportunities to harvest writing ideas. It is a lens through which to view the limitless possibilities of the moment." I have thought of his words many times throughout this month because I really have noticed life differently, given the pressure of a daily slice. 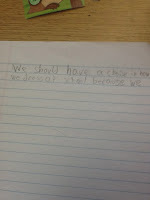 In the classroom, I wonder about teaching more of the noticing that goes along with writing. I could not just sit down at the computer and concoct my post; I noticed and nurtured a thought, memory, reflection, or moment before the actual writing. My writing life encompassed much more than the hour or so that I wrote, read and commented. What does this mean for our teaching practices? I have learned more, but I know that there will be many reflective words to read today as we all finish our month of daily writing. Thank you to Ruth and Stacey for creating this experience, thank you to all of the people who have helped, and thank you to all of the people who have read and commented on my work throughout the month. I will miss the routine but will certainly continue on a weekly basis and I look forward to next March. This month I am participating in the Slice of Life Challenge hosted by Stacey and Ruth at twowritingteachers.wordpress.com. Check out some of the comments there to see what others are writing. In my work as the district's writing coordinator, many teachers have asked me about the pre-assessments that exist at the beginning of almost every one of our units. "How can I ask them to do something that I haven't really taught them?" 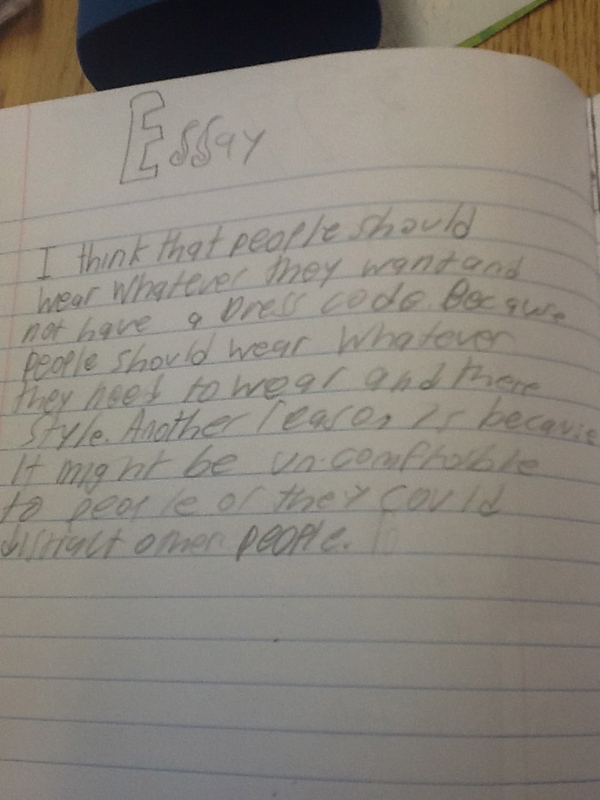 Part of the answer to this question goes back to the Lucy Calkins adage, teach the writer, not the writing. Part of the answer also lies in a question: Why teach them what they already know? They might surprise you. Pre-assessment does not mean that the expectation is to stay with that writing piece and work on it until it is perfect. Pre-assessment is one of the strongest examples of how we use assessment to guide instruction. 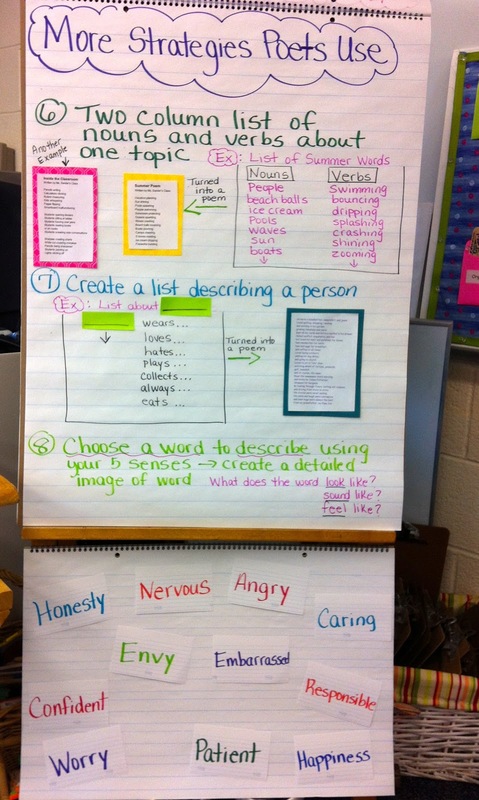 Yesterday, we were in a classroom with a staff developer from Teachers College Reading and Writing Project and she launched fourth graders into an argument essay unit. Most of them had never written an essay before, so Emily Smith gave a quick lesson on how an essay goes and how to plan for it by having them read a mentor essay. 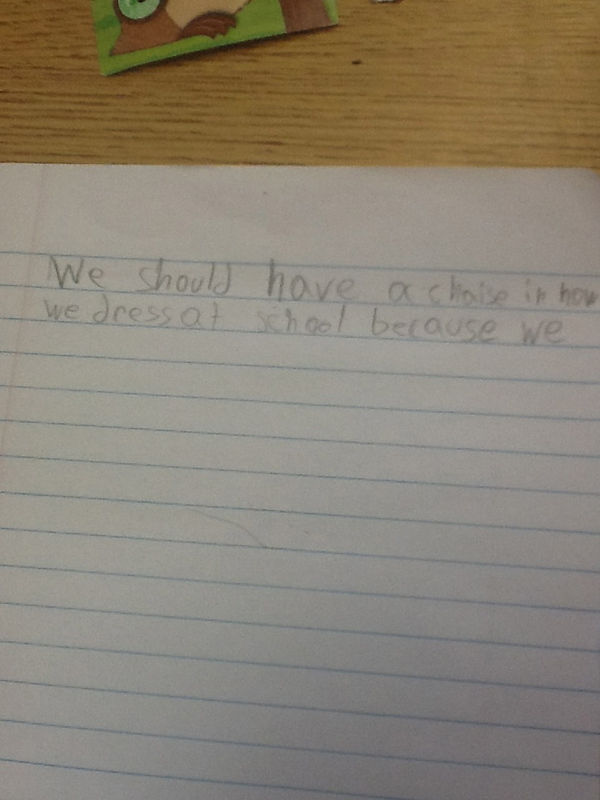 She gave them the topic of dress code to think about and walked them through how to think about reasons and examples. All of this took less than fifteen minutes. Then, she sent the students off to write. Within another ten minutes, here are some of the products. These two examples are pretty solid introductions, especially when we think about the fact that this is the first day of the unit. These were two of the higher examples that I saw, although there were some students who were able to keep going using paragraphs and ordinal words. These students would thrive on various ways to craft an introduction, incorporate quotes, interject voice--they could explore some sophisticated craft moves. 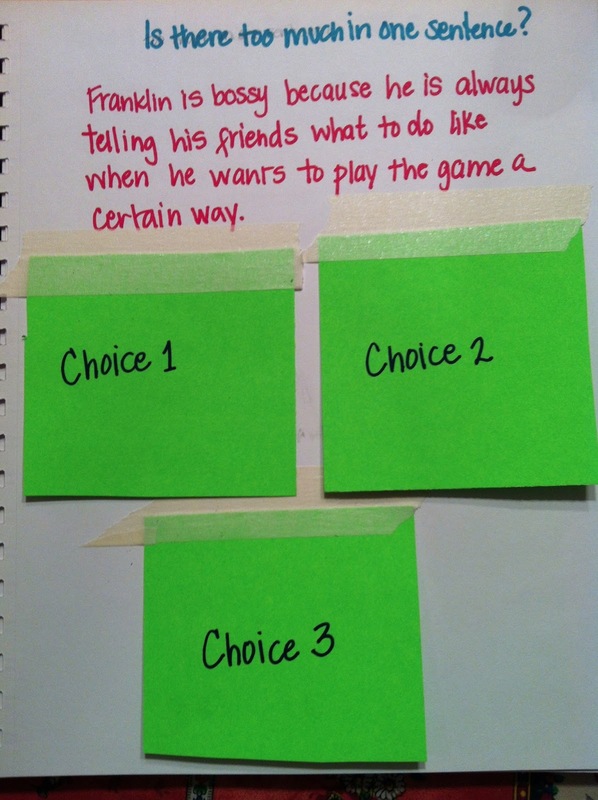 This next example was from a child who was having a harder time accessing his reasons. 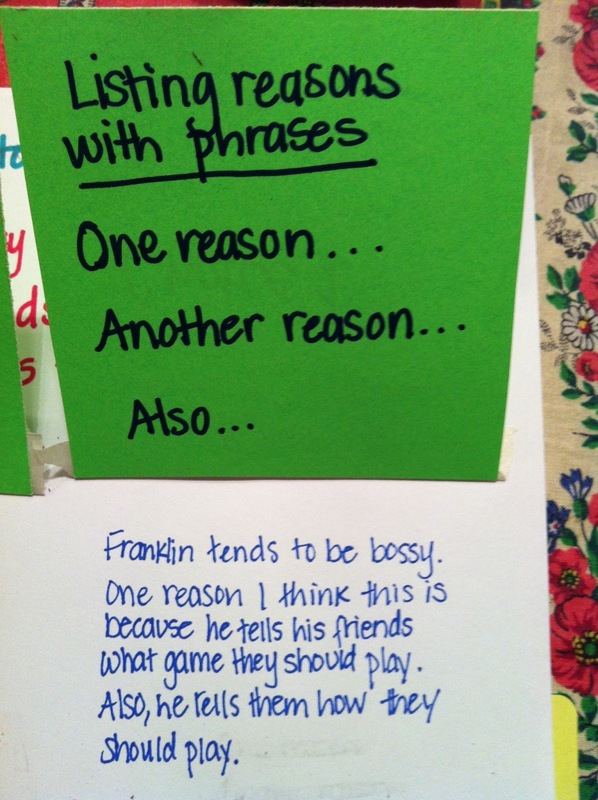 From an instructional standpoint, he might need verbal rehearsal of reasons--he might even need practice at stating his opinion since I'm not sure he didn't just copy the one that Emily had put on the class chart. So the question is what to do next? Do we go back to these pieces and work with them? You could. But, maybe you don't go back to them at all, but just tuck them away so that you can take them out at the end of the unit and celebrate the learning. I share this because it was an example of an assessment designed to guide instruction, regardless of whether the teacher continues with these pieces or tucks them away. The students were not stressed, the results are not to be entered into the computer, they do not impact report cards. Assessment can actually be a really good thing for teaching and learning. March Madness Book Edition: Final Four and Final Two! This month, my class is participating in our very own March Madness Book Edition! 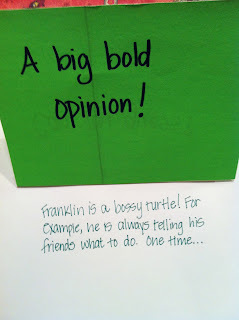 Click here to read the posts about how this idea came to action in our classroom and how we got started. Yesterday, we narrowed down the books down to our Final Four and then we narrowed it down to our Final Two today! One of my students made the ballots on Google Drive and printed out copies for each student to vote by circling their favorite book within each pair. He also included each title's seed number next to it. Yesterday, I tallied up all the votes and officially announced the titles in our Final Four and then I announced the Final Two today! Below is our March Madness bulletin board with our brackets that we keep adding to after each voting round. 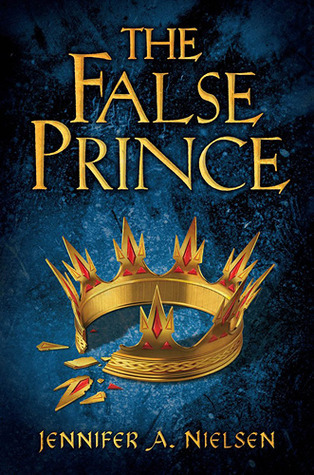 One for the Murphys by Lynda Mullaly Hunt, The One and Only Ivan by Katherine Applegate, The Running Dream by Wendelin Van Draanen, and The False Prince Trilogy by Jennifer Nielsen. For the month of March, I am participating in the Slice of Life Challenge, hosted by Stacey and Ruth at twowritingteachers.wordpress.com. Everyone loves comments, so feel free to link over and see what others are writing! When I was in New York for the Teachers College Reunion a couple of weeks ago, Kate Roberts gave a presentation about writers' toolkits. (I wrote about it here.) Since then, I have been thinking about how to start my own for various grade levels and writing units. Then, I had to start writing in ways that young writers might do. 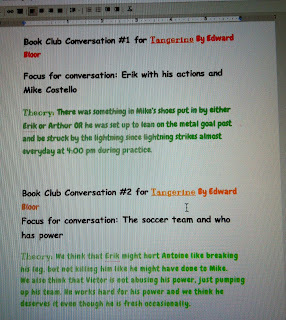 The goal of the book is to show students samples of not-so-great writing and strategies for making it better. After sorting through some piles of second-grade writing, I had some inspiration. I imitated some of their common mistakes on pages in the book. 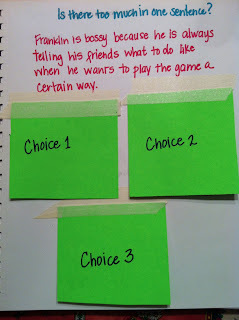 In order to create a sense of play, I made three options for how to "fix" my writing on some of the pages. 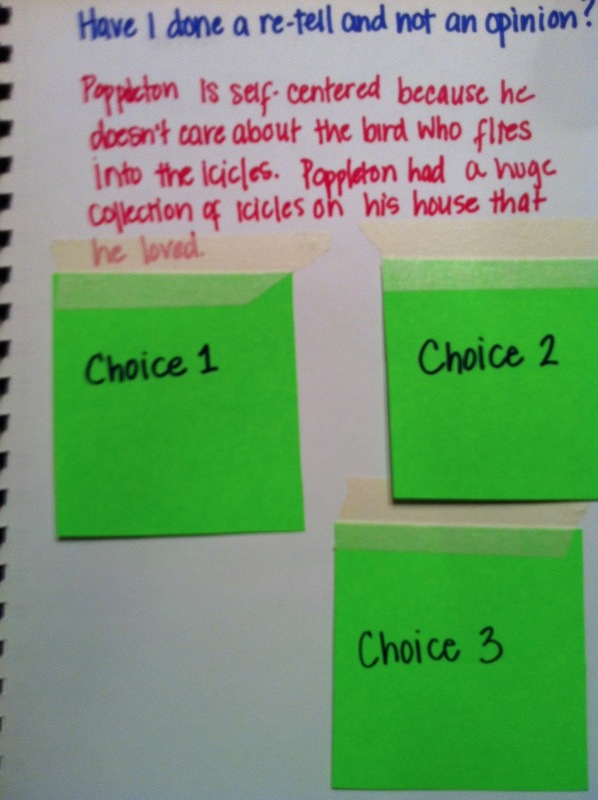 Students can lift the flaps in order to see a choice. On another page, I asked the question, "What is missing in this writing piece?" 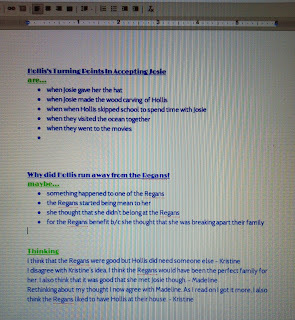 Again, I used a flap to create some play within the lesson and wrote the writing sample over with what was missing. My goal is to continue to develop pages, although the pages take a little longer than I had anticipated. This will be a work-in-progress, but I hope a valuable teaching tool for coaching teachers and for working with students. If anyone out there wants to contribute some common student mistakes, I would definitely appreciate them! During the month of March, I am participating in the Slice Challenge, hosted at twowritingteachers.wordpress.org. 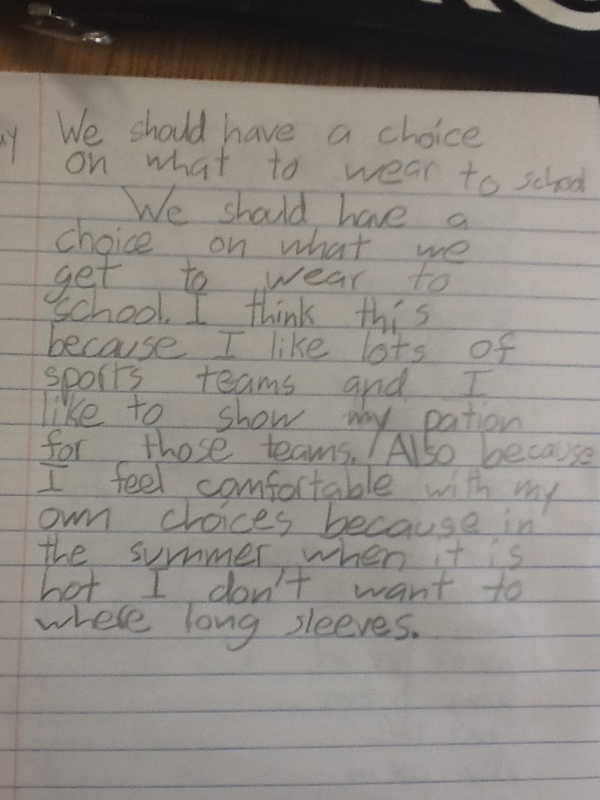 My fifth-grade daughter struggles to make sense of mathematical concepts, but she is a strong reader and writer. I have been reading Jim Knight's book, High Impact Instruction, and his chapter about stories resonates with me. He wrote that stories have the power to help people remember information. Since then, I have been re-thinking some math stories that I worked on last year. I wrote this story tonight because Cecily was having such a hard time understanding the concept that zeros after a decimal number don't change the value of the number. For example, .9 is equal in value to .900000. I am wondering about the value of stories for teaching some of our students who have strong verbal skills, but struggle with understanding or remembering increasingly abstract mathematical concepts. Once upon a time there was a one digit decimal, .9. Nine-tenths, otherwise known as NT to the other numbers was mostly happy. He was included in many fact challenges and word problems and, even though he didn’t understand why, most students were really happy to see him show up on their papers. Definitely, .95 and .99 seemed to make students happier, but they were okay with .9, as well. This made no sense to NT and NT didn’t participate in many of the games that numbers play with each other because he felt smaller than so many of the other numbers. NT would sit to the side and watch .89 play volleyball math against .851 and .1234. He wished that he were like them; they were so big with all of their numbers. NT wished that he could have more numbers like they did because he always felt so small around them. Sometimes, they would invite him in to play but he never said yes. “They are all so much bigger than I am,” he always thought to himself. “We’re going to play a soccer game,” .333 said. “Why don’t you join us? NT shook his head. He wanted .333 to go play so that he could just watch and feel small. “I can do that?” NT couldn’t believe it. Was he really bigger than the other decimals? All he had to do was add zeros? “What if .89 adds a zero, though?” he asked. NT got up and followed .333 on to the field to join the number games and he never felt smaller than any number that started with an 8 after the decimal place again. I'd love feedback or ideas for more personified numbers! One of my favorite writing units during the year is our poetry unit and students always enjoy it too! 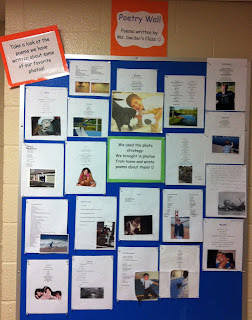 For the past couple weeks, we have been writing lots of poems using a variety of strategies. 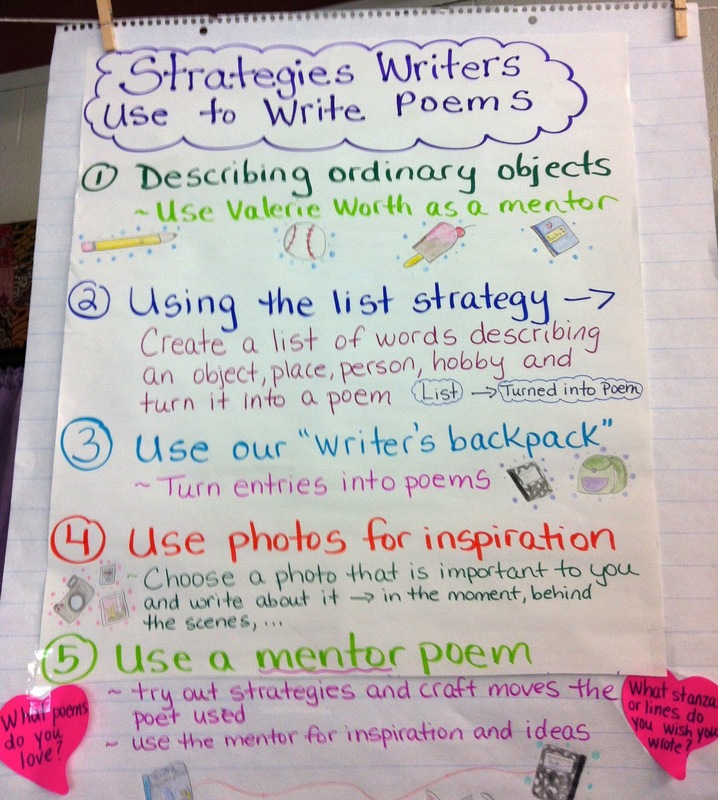 I like to teach and model various strategies to give students a whole "toolbox" of strategies they can choose from as they write their own poems. Below you will find two of our class charts listing the strategies I have been modeling so far and that students have used in these two weeks. During each mini lesson, I first model how I used the strategy to write my own poem and then we work as a whole group to write a class poem using the strategy, during the active engagement part of the mini-lesson. Students have been using Google Drive to write their own poems and love sharing them with their writing partners and with me to get feedback/comments. 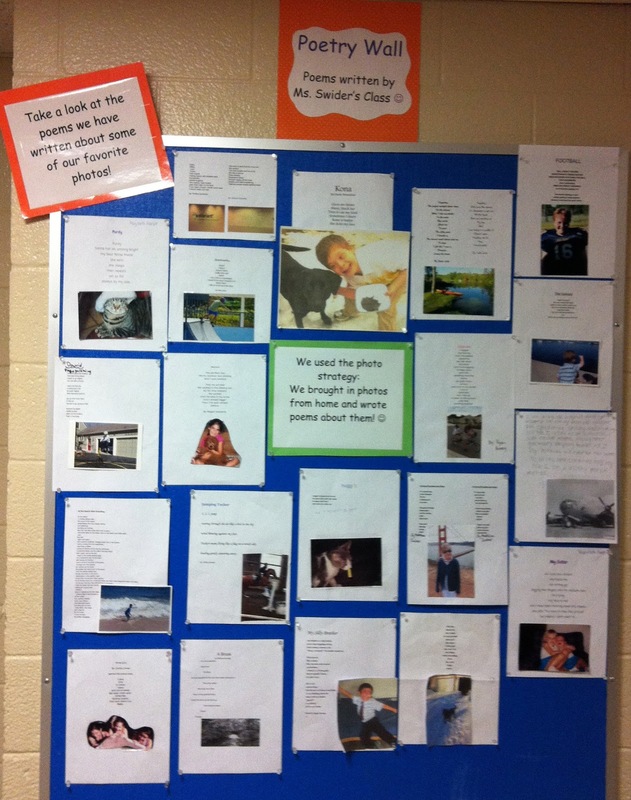 Students have all created a poetry folder within their writing folder in their digital portfolio on Google Drive and have a large collection of poems using a variety of strategies. This month I am participating in the Slice of Life Challenge, hosted by Stacey and Ruth at twowritingteachers.wordpress.com. One of my favorite parts of my position as a writing coach is getting to do guest lessons. Last week, I was talking to one of our kindergarten teachers about the different ways to get her students thinking about procedural writing. I mentioned that I had wanted to get the students to write a how-to book about blowing a bubble in a different class, but hadn't gotten the chance, so she immediately invited me in to try it out in her class. When I told the students that we were going to write the steps for bubble-blowing, they were excited and they helped create a set of instructions that they thought would work. Then, I took out a pack of gum. Yes, I put the whole pack into my mouth since they had said to "put the gum into your mouth." Then, I put several pieces into my mouth since there was no specification of how much. "Chew it," they said, so I chewed a few times. They caught on and created more specific directions before I could create too many messes, although I did have to wash my hands a couple of times since the initial instruction had been to "flatten the gum on the top of your mouth." While this lesson got a lot of laughs, the teaching point was clear. 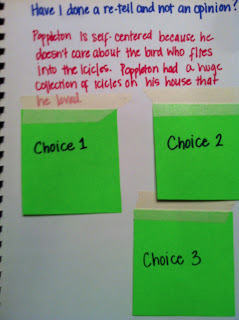 Writers have to be specific about their directions when they are writing how-to books. The class went on to create the following chart and their how-to books have become increasingly more specific and full of directional words. Our kindergarten students have gone on to create books and videos for next year's classes to explain procedures and routines to them. These videos have been incredibly motivating to the students and they have been careful to make sure that their details are precise and specific so that new kindergarten students will know exactly how to sign up for lunch. 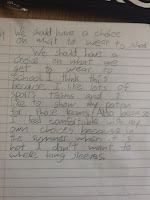 Common Core Standards jump to life when children have a purpose that motivates them and an understanding of the task. These children will accomplishing reading, writing, speaking and listening, and language standards and they were completely invested in the task. I read a few different books this past weekend, but one of my favorites was Eight Keys by Suzanne LaFleur, who also wrote Love, Aubrey which is another powerful story. 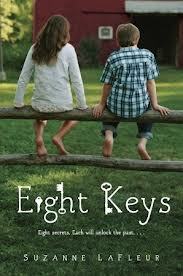 If you read and loved Jeremy Fink and the Meaning of Life by Wendy Mass like I did, then you will love Eight Keys! It is a powerful and inspiring story about a young girl, Elise, who lives with her aunt and uncle because both of her parents passed away by the time she was three years old. She is in middle school and facing challenges with one girl in particular who is making her school life miserable. 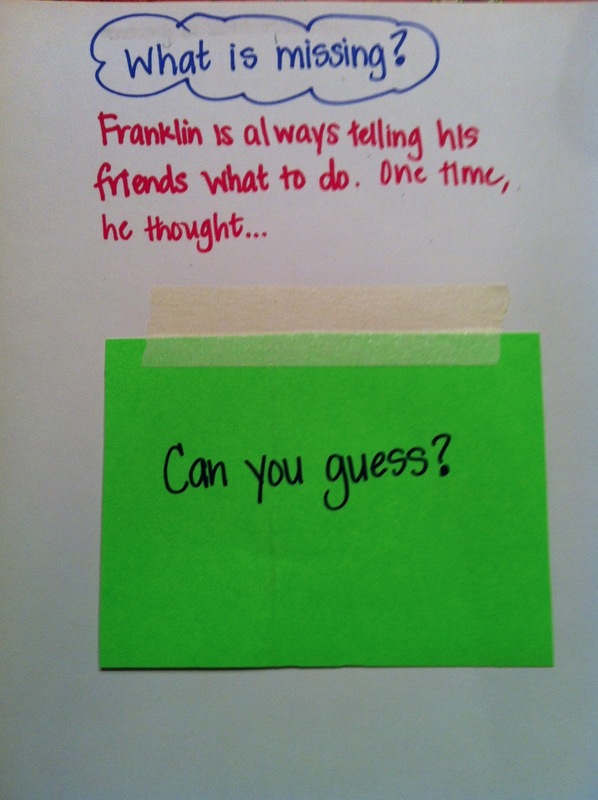 She is also struggling with keeping up with school work and keeping her friendship with Franklin, who she has been friends with forever. Before Elise's father passed away, he wrote her a bunch of birthday letters so she could receive one on each birthday until she was twelve years old, which she is turning soon. However, even though the letters stop after her 12th birthday, she discovers that her father also left her eight keys that open up mysterious doors in her uncle's barn. She begins to find the keys in different places and at times when she seems ready to receive another one. The keys and doors reveal a lot about her past, her parents, and herself. 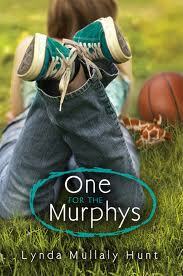 She begins to see her life, friendships, and school through a different lens. I think Eight Keys will be our next read aloud that we start this week! 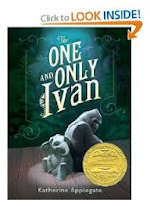 It is a great book for middle grade students and would be a great companion text to read before or after Jeremy Fink and the Meaning of Life by Wendy Mass. 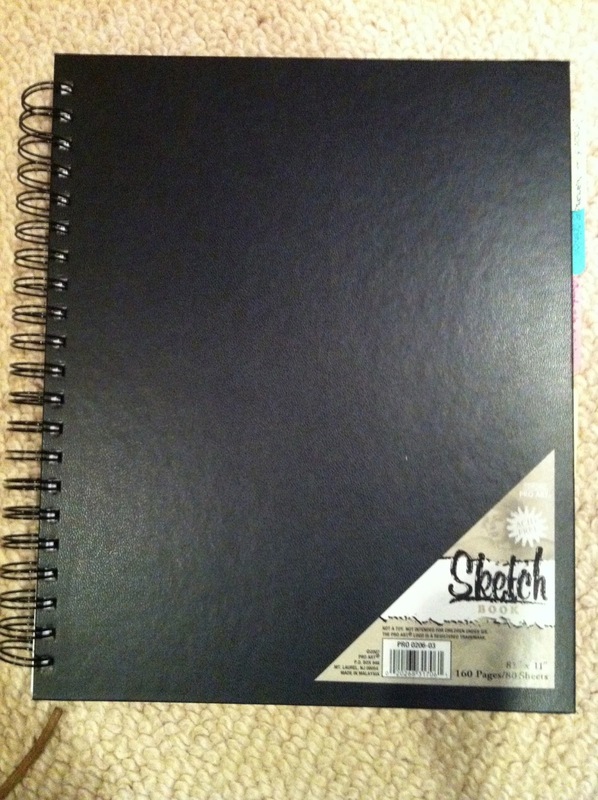 During March, I am participating in the Slice of Life Challenge, hosted at Twowritingteachers.wordpress.com. Today, I am doubling up, and linking this post to It's Monday! 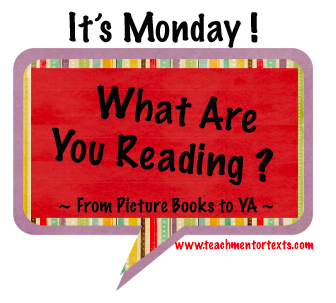 What Are you Reading, hosted at Teachmentortexts.com. Check out either of these sites for what other people are writing and reading! I am thinking about and working on a new curriculum for our sixth-grade that has to do with specific regions of the world. As we try to decide on regions, I have been looking for titles that we can integrate meaningfully into lessons. Facing the Lion by Joseph Lemasolai Lekuton is a memoir/autobiography of an African man and the nomadic childhood that he had as a Maasai on the African Savanna. We can all learn a lot about the lifestyles, customs, challenges, and joys of Kenyans from reading this book, although I would not recommend it for children younger than fifth or sixth grade and then, be prepared to explain about circumcision. I also re-read Iqbal by Francisco D'Edamo, the story of a Pakistani boy who was sold into slavery and inspired many children, including the narrator, to question and challenge their existences as child slaves. Iqbal's story inspired Craig Kielberger to found freethechildren.org, an organization that grown over the last fifteen years and has the motto, "children helping children." Again, I'm not sure that Iqbal would be appropriate for children younger than sixth-grade, but I think that it has the potential to inspire older students to act on the injustices that exist in the world for children. Professionally, I read Our Iceberg is Melting by John Kotter which is a parable about the change process. In this book, penguins are personified and are facing a challenge in that they have to re-locate or find themselves without an iceberg. Each penguin represents a prototype of a person responding to change. The writing is simple, but the message is complex, and it's a great book for getting people to think about what sort of penguin they are! During the month of March, I am participating in the Slice of Life Challenge, hosted at twowritingteachers.wordpress.com. All month, I have been impressed with the great writing that bloggers are doing. Feel free to check out some of the links and comment! My husband and I had an overnight in New York this weekend and I want to thank Katherine Sokolowski for encouraging nerdy behavior because we listened to Ted Talks on the way in and out of the city. We listened to a few, but Simon Senek's talk about how leaders inspire action resonated with me and kept my husband and me discussing and debating after the talk ended. In this talk, Simon Sinek talks about several famous leaders and innovators and the idea that they lead with what they believe, not with what they do. Simon describes a circle that dictates action and consists of what we do, how we do it, but most importantly, why we do it. His message is that we generally know what we are doing and how to do it, but don't spend enough time thinking about why we do it. One of the most memorable parts of his talk was when he reminded us that Martin Luther King's speech was "I Have a Dream" and not "I have a plan." What struck me is that many of us in education have plans that guide what we will do but not visions that are defined by why we will do it. The Common Core State Standards are guiding the practices of many educators in this country. These standards dictate what students should know and be able to do by the time they graduate and so we, in both of the districts that I know well, are working hard to figure out how to make sure this happens. I admit that I am right there at the forefront of that work. Simon Sinek's talk made me stop and think about the "why" behind my work. Have I paid enough attention to the reasons for the Standards and how those reasons intersect and integrate with my beliefs about education? Am I able to state my "why" as easily as I state my "what" and my "how"? All children have a right to a meaningful education. Curiosity and passion lead to engagement which leads to mastery and achievement. People learn from each other and ideas and innovations develop out of collaboration and reflection. Relationships matter across all ages and stages of humanity. I need to keep thinking about my beliefs because I'm certain that I'm missing something important. It's important to me that the "why" dictates the "whats" and the "hows" of my daily practice. And, I do think that they intersect and integrate with the work that I am doing not only around the CCSS, but also around my vision of a graduate. I do want to keep thinking about this, though. If you have time while you're folding laundry or driving, TedTalks are amazing for thinking and learning. If you have some favorite talks, please share them! 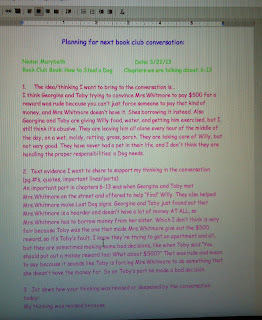 To read Using Google Drive in Book Clubs: Part One, please click here. 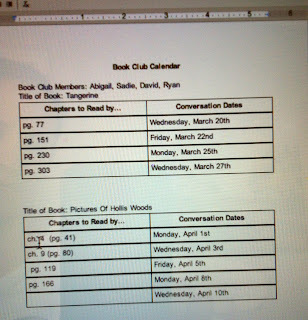 plan out their reading on a calendar to keep track of which chapter to read for each conversation date (book clubs meet every Monday, Wednesday, and Friday). 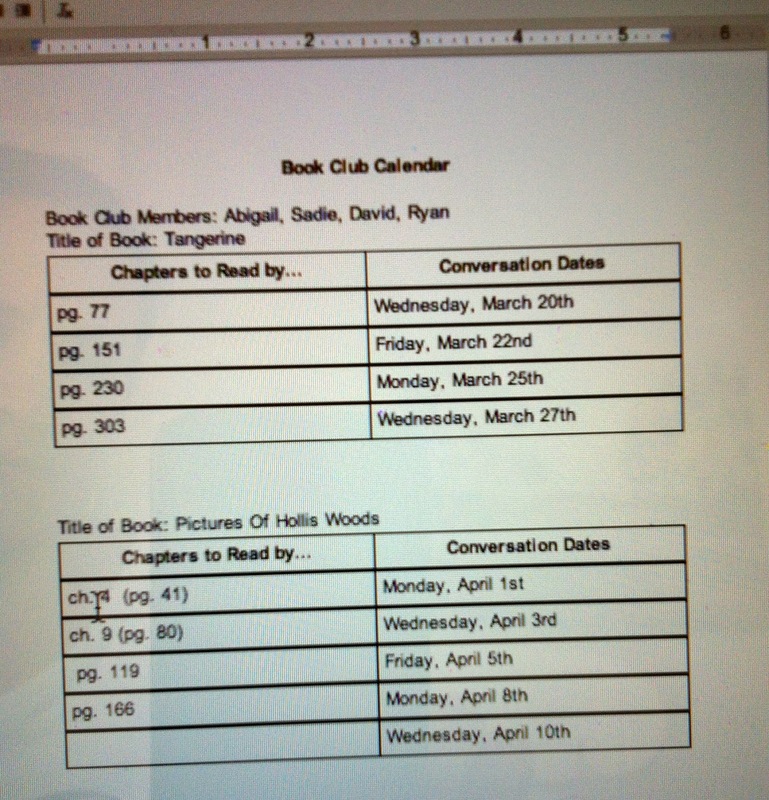 By creating the calendar on Google Drive, book clubs can access it from anywhere to see what they need to read for the next conversation, without having to worry about losing the paper calendar or forgetting it at school. 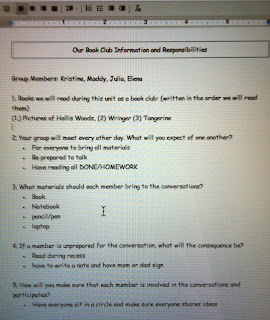 create a book club contract to agree on their responsibilities as a book club, what to bring to each conversation, and what the consequences will be if they are not prepared. By creating the contract on Google Drive, students can access it from anywhere to be reminded of consequences if they aren't prepared and also have the reminders of what to bring with them to each conversation so they are prepared. 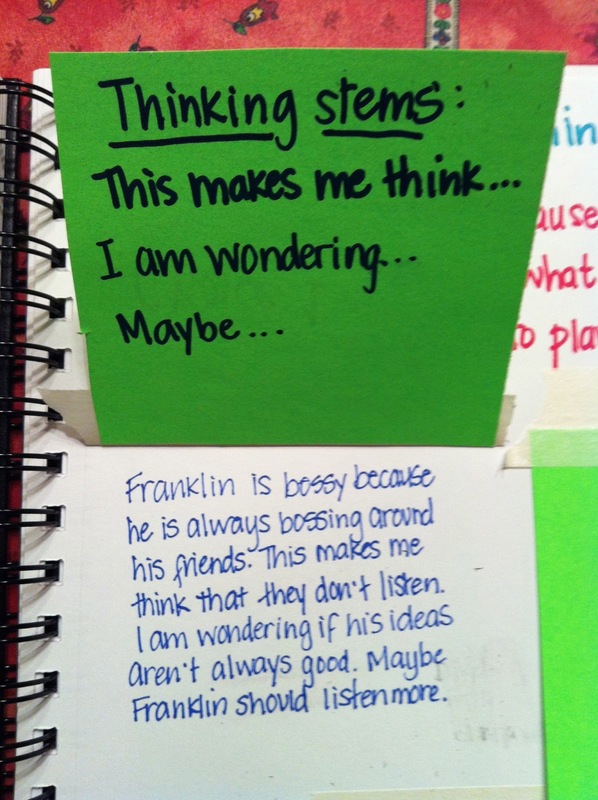 prepare for their next conversation by jotting down their thinking, ideas they want to bring to the conversation, and text evidence they have collected to support their ideas. Some students are still choosing to use their book club notebook to jot down their ideas and create charts to prepare for their conversations, while others are using a combination of both. 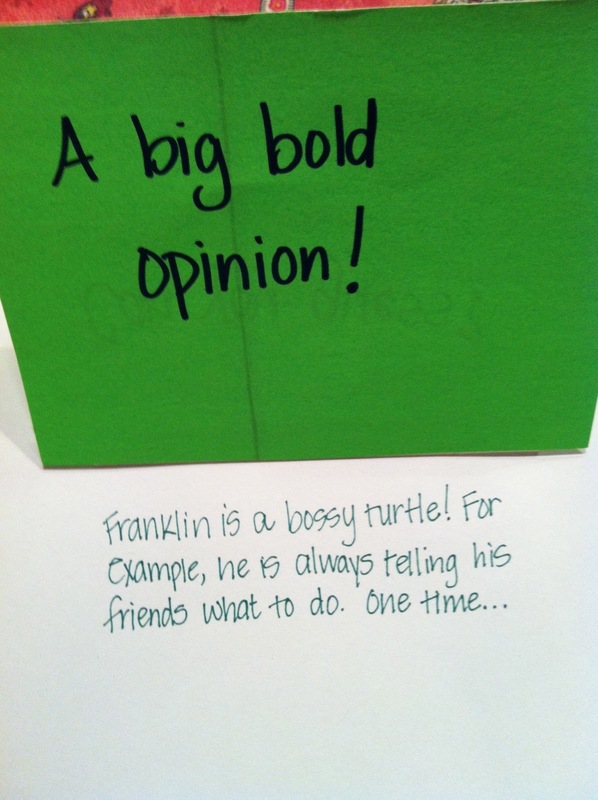 record notes from each conversation by noting what idea they focused their conversation on, what evidence they talked about, and what they would like to continue talking about for their next conversation. 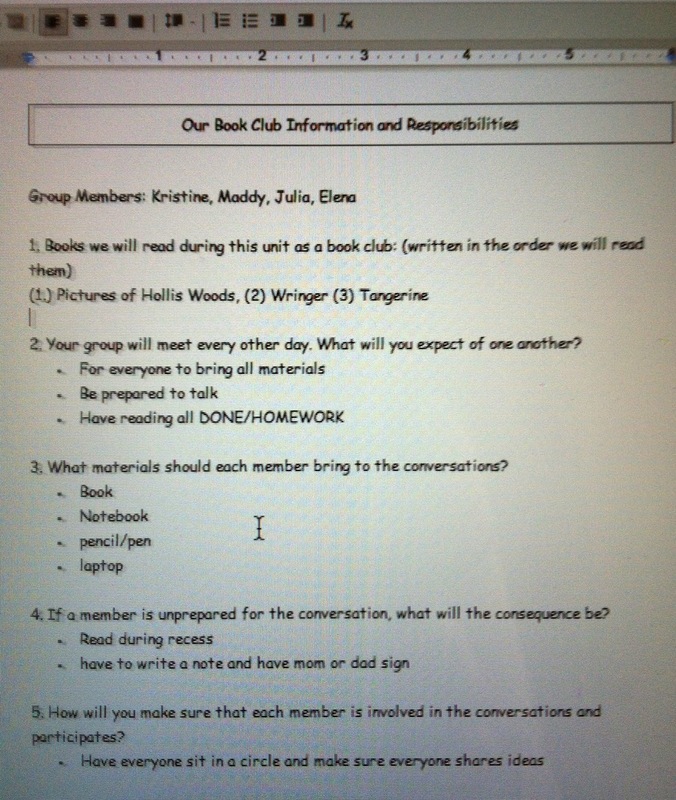 Book clubs that are choosing to use Google Drive to record parts of their conversations, are bringing a laptop to each conversation and taking turns typing the information. Since I am only one person and can't be in five places at once, this is great for me because I can see what each club talked about even if I didn't get a chance to physically be with that club that day. 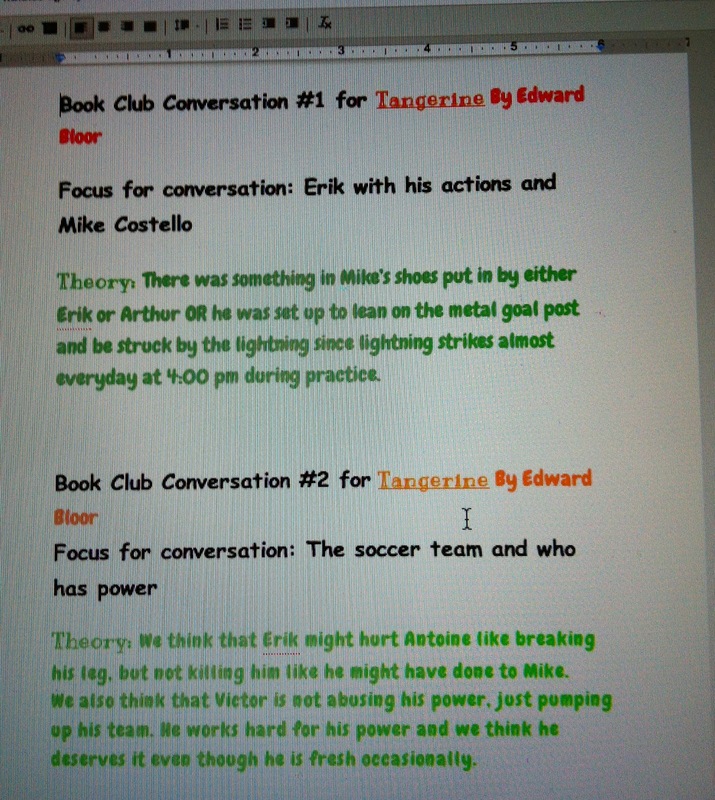 It is also great for book clubs because they can continue to refer to their past conversations so they are piggybacking onto their ideas and can see how their thinking is evolving. 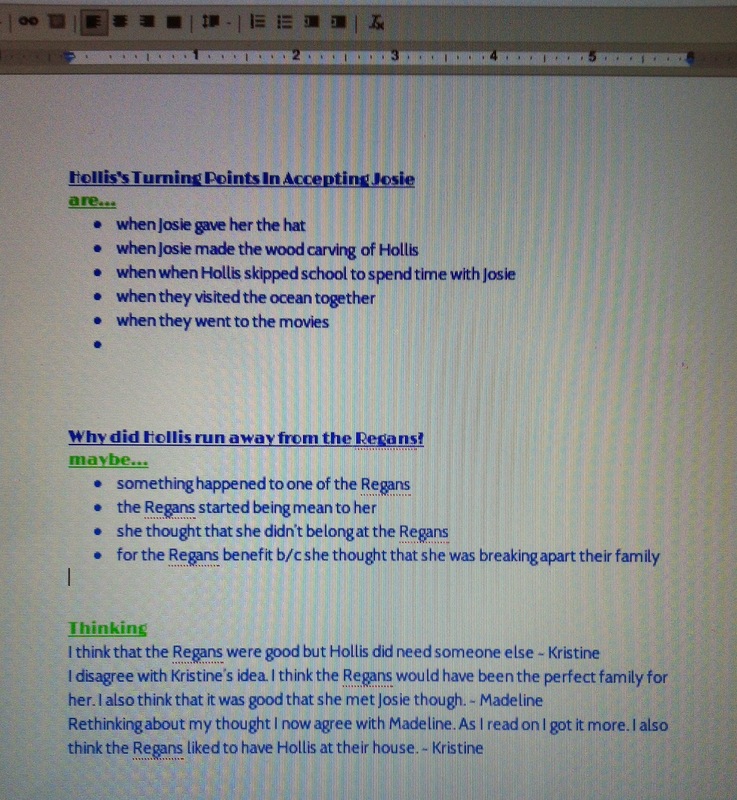 To see examples of how they are using Google Drive in these ways, please see the photos below. I apologize in advance for the blurriness, but I took the photos from the computer so it doesn't always come out clear that way. 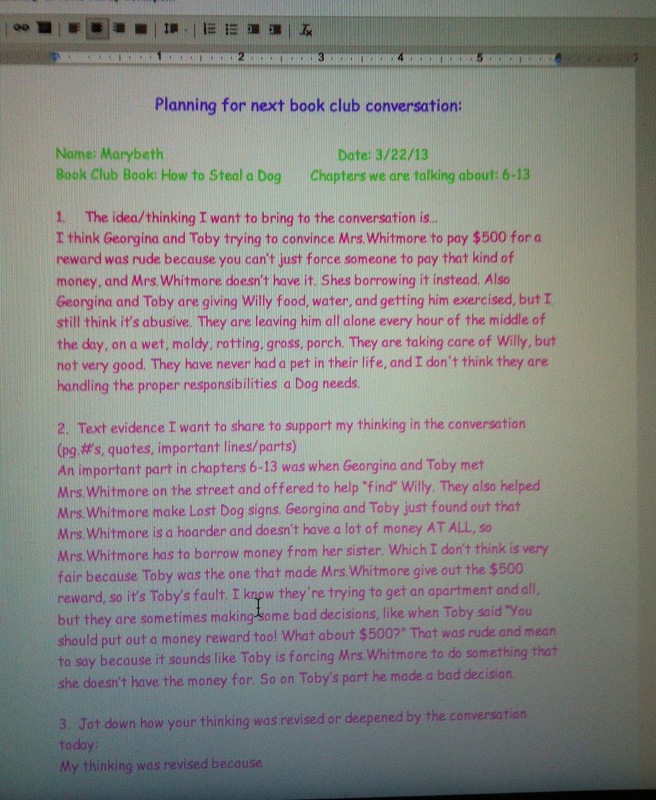 I will continue to share ways they are using Google Drive in their book club conversations so stay tuned! 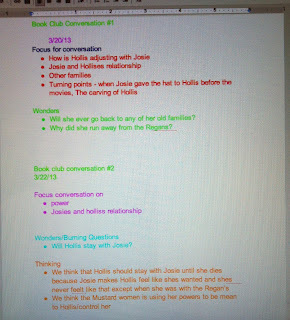 I would love to hear about other ways you are using or have used Google Drive for book clubs in your classrooms, so please share!